Manchester United have agreed to give debt-ridden Leeds United a final payment of £1.5m for Rio Ferdinand. The England defender, who is serving an eight-month ban, moved from Leeds to Old Trafford in July 2002 for £29.3m. The majority of the fee was paid up front, but United still owed Leeds £3.25m which they agreed would be paid in instalments. But Leeds have accepted the reduced amount to put towards the £5m they need to save the club from administration. The Elland Road club, who are believed to have debts totalling £100m, have until 1700 GMT on Friday to try and find the money which would satisfy their creditors until the end of the season. The money from Old Trafford will help ease that process as it should reach Leeds chiefs by Thursday. The deal means Leeds have given up £1.75m on the transfer, which remains a British record fee. United released a statement to the Stock Exchange to outline the proposed deal. "Manchester United has agreed to pay to Leeds United FC, via the FAPL (Premier League), £1.5m on Thursday," the statement read. 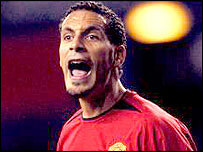 "It is a full and final settlement of the deferred conditional sums due on the Rio Ferdinand transfer totalling £3.25m. "A levy of £75,000 is also payable to the FA Premier League."